The world is in mourning. We have lost our greatest statesman. Madiba was a leader who by his courage demonstrated that it is possible to reconcile differences. By his example he showed us that it is possible to build peace out of conflict; a better and more equal future based on fairness, and unity out of division. In the hard years when the western powers were against him, when he was vilified as a terrorist and a criminal, he kept the faith. He showed perseverance and vision. There are lessons in all of this for us but particularly for the people of the island of Ireland as we continue the necessary and challenging task of building the peace. I first saw Nelson Mandela when he visited Dublin in 1990. That was the day the Irish soccer team returned home. When Madiba appeared a section of the crowd began to chant ‘Ooh ahh Paul Mc Grath’s Da’. The craic was ninety. In 1995 myself, and several other activists travelled to South Africa at the invitation of the ANC to speak to senior figures from that party who had been centrally involved in the process of negotiations. That was when I met Madiba for the first time. It was almost a year after the IRA cessation and just over a year since the first post apartheid election which returned Madiba as President of a Free South Africa. Myself, and several colleagues travelled there at the invitation of the ANC to speak to senior figures from that party who had been centrally involved in the process of negotiations. The ANC also arranged meetings with representatives from the National Party, General Constand Viljoen leader of the Freedom Front Party and Dr. Niel Barnard the head of the Apartheid regime’s National Intelligence Service. In developing the Sinn Fein peace strategy toward the end of the 1980s and into the early 1990s Irish Republicans had recognised the importance of the international community as an ally for making progress in a peace process and as a source of inspiration and information for our own endeavours. While much of our focus was on Irish-America, which had the greatest concentration of the Irish diaspora, Irish Republicans had always had a close affinity with the struggle in South Africa. In my youth one of my first demonstrations was in Dublin against apartheid and the visit of the Springbok Rugby team. I was a long time supporter of the Anti-apartheid movement. The purpose of our trip in 1995 was to learn the lessons of South Africa’s approach to conflict resolution, and to brief people on the difficulties in our process. Walter Sisulu, Cyril Ramaphosa, Thabo Mbeki, Cheryl Carolus and many others in the leadership of the ANC made us very welcome. However, for all of our group the highlight of our many meetings was with Madiba. He was self-effacing in his humour, totally relaxed and very focused. As ever the British government, and sections of the British media, had made much about whether or not there would be a handshake, would there be a photograph and so on. The Major government had lobbied hard for Mandela not to meet me. 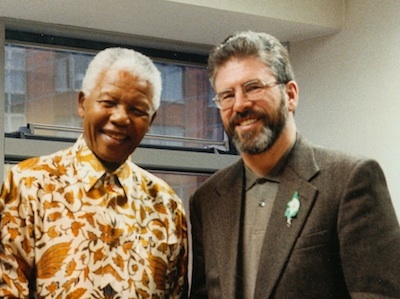 His response was simply put as we shook hands in his office: “Ah, comrade Gerry, I’ll not wash my hand for a week.” Madiba thanked me for the solidarity that Irish republicans had extended to the ANC and the anti-apartheid struggle over many years. It was my privilege to meet Madiba many times after that; in South Africa, in Ireland and Britain. He was funny, engaging and modest and hugely supportive of the Irish peace process. Along with his comrades in the ANC he was very helpful and he had a depth of understanding of the twists and turns of our process. He was very loyal to those, including Irish republicans who had helped the ANC in difficult times. His outreach to Sinn Fein in the ‘90’s was resisted stridently by the British Government and criticised by sections of the media. In 2001, on the 20th anniversary of the hunger strike, I travelled to South Africa to unveil a monument to the hunger strikers, in the yard in Robben island prison where Madiba spent much of this time imprisoned. As part of that visit Madiba and I met again and spent several hours talking about the Irish peace process and the changing face of South Africa. In 2003 he visited Dublin to open the Special Olympics at Croke Park. Martin McGuinness and I met him privately for discussions. Despite his age and increased physical frailty his mind was as sharp as a razor; conversant with the twists and turns of our process as well as the affairs of his own continent or the injustice of the war in Iraq. Madiba will continue to inspire and encourage oppressed peoples everywhere. His legacy will live on. In the words he used to salute his friend and comrade Walter Sisulu. Hamba Kahle, Madiba. Qhawe la ma Qhawe!